Where do you purchase your baobab fruit? We obtain our fruits from carefully selected partners in Africa (Senegal, Malawi and Kenya). When it comes to our partners sustainable and socially responsible farming is particularly important to us. We are directly in contact with the local communities and processing companies. On our last journey to Senegal we produced our documentary film “The journey from Baobab to wow!bab” to share our impressions.Watch the movie on youtube, vimeo and here on our website. Why does the wow!bab cereal bar contain no palm fat? Unfortunately, the production of palm fat has become a massive environmental threat. As a result we prefer to use cold-pressed sunflower oil in our wow!bab bars. Does wow!bab contain added flavours? No, we exclusively add pure infusions made from sunflower oil and citrus fruits without the use of Ethanol or other solvents. 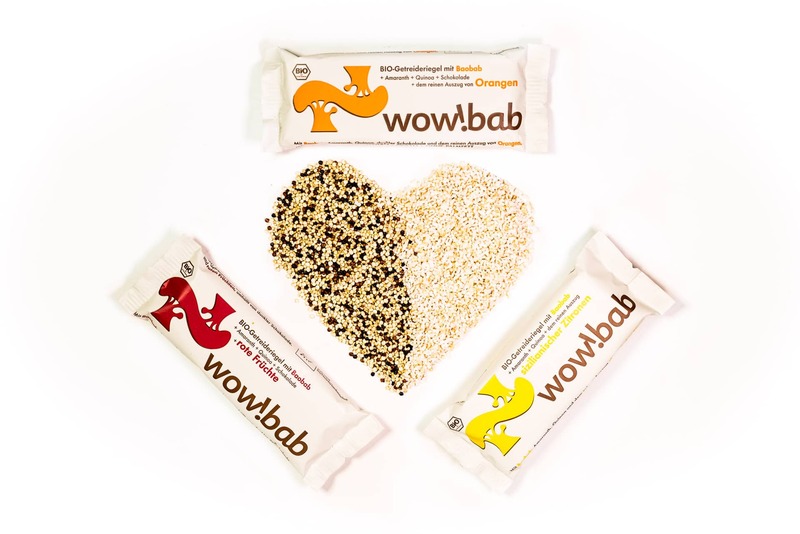 For our wow!bab cereal bars we mainly use vegan rice syrup due to its mild flavour. Our crunchies are sweetened slightly with vegan coconut blossom sugar with its typical light caramell note. Our organic wow!bab mueslis are not sweetened at all but the sprouted cereals contain natural sugar. Where do you produce wow!bab? All our wow!bab products are made in selected family-run facilities in the EU using our very own recipes. Why do the wow!bab cereal bars contain ancient crops? Amaranth, quinoa and chia have been cultivated in South America for millenia and are naturally gluten-free, a valuable source of energy, protein, minerals und healthy fats. Why do you use "sprouted seeds"? The special characteristic of our wow!bab Crunchies and organic muesli is the use of sprouted seeds and cereals. Through the use of new optimized germination methods, the sprouting process of grains is stopped when the nutrient content is at its highest pic – for an optimum utilization of vitamins, minerals and trace elements. Nutritional value and vitamin content increase enormously during germination. The total protein content also increases by about 20 percent. The quantity of vital substances, which is rather sparse in corn grain, is multiplied and made into an easily absorbed form. Minerals and trace elements such as calcium, potassium, phosphorus, magnesium, zinc and iron multiply and can be absorbed and utilized much more effectively. Much more about wow!bab and our corporate philosophy in an interview with wow!bab founder Frédéric Letellier for www.bakeryandsnacks.com at the ISM-Cologne -the world’s largest trade fair for sweets and snacks- in 2017.